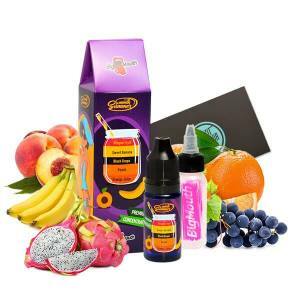 Big Mouth is the american range well known for e-liquids which launch in DIY. Big mouth proposes a very orignial concentrated range containing a bottle with a sticker to create your DIY. The concentrated Big Mouth with excellent gourmet flavours in respecting the manufacturing quality standards of vape. Placed with Fruits, this mixture of Dragon Fruit, Banana, Grapes, Peach and Orange Juice.